Young entrepreneurs from St Paul’s school, London, who had already won the HSBC UK Young Enterprise Company of the Year at the Young Enterprise national final, have been crowned European Company of the Year at the Junior Achievement European final in Belgrade. The team faced stiff competition from 33,977 schools in 40 countries across Europe. The runners up were teams from Finland: ‘Bugman’s Best’ (a nutricious snack made out of locally grown crickets), and Italy: ‘OKelvin’ (tags to inform you when your drink is at the right temperature). The winning UK team, ‘SureLight’ created from scratch and sold an innovative and unique smart brake light for bicycles, improving cycle safety. The European Company of the Year competition was held in Belgrade, Serbia on 18th July and was the 29th year of the award. 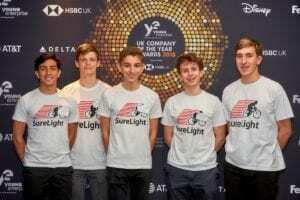 ‘Surelight’ competed in the Young Enterprise Company of the Year competition. Young Enterprise in the UK works with over 250,000 students every year and this year over 15,000 young people set up and ran a real business with Company Programme. The overall winning European Company of the Year team is judged against a strict set of criteria including innovation, sales, marketing, financial performance, social impact and teamwork. ‘SureLight’ from London wowed judges with their company report, trade stand, interview, and presentation. Company Programme students develop their key employability skills by making all the decisions about their business, from deciding the company name and product, to creating a business plan, managing their finances and selling their products. A longitudinal study of Company Programme alumni has shown that in the two years following their company’s closure, 94% are in education, employment or training [EET] – 7% higher than the national rate.